Knapheide's Heavy-Hauler Junior Platform Body is equipped with external rub rails, integrated tie down points and stake pockets, along with a heavy-duty bulkhead and robust flooring options. Add steel stake sides to a Heavy-Hauler Junior Platform Body to transition into a dedicated Stake Body, or choose a hoist for dumping applications. The Heavy-Hauler Junior Platform Body is designed to be multi-faceted in order to suite a wide variety of vocations. The Heavy-Hauler Junior offers all the features you need to tackle tough jobs without breaking your budget. SAN DIEGO – The 2016 Ted Williams All-Star Game Most Valuable Player, Eric Hosmer, chose a Chevrolet Colorado Diesel Midnight Edition during the MVP award ceremony presented by Chevrolet at Petco Park in San Diego on Tuesday night. 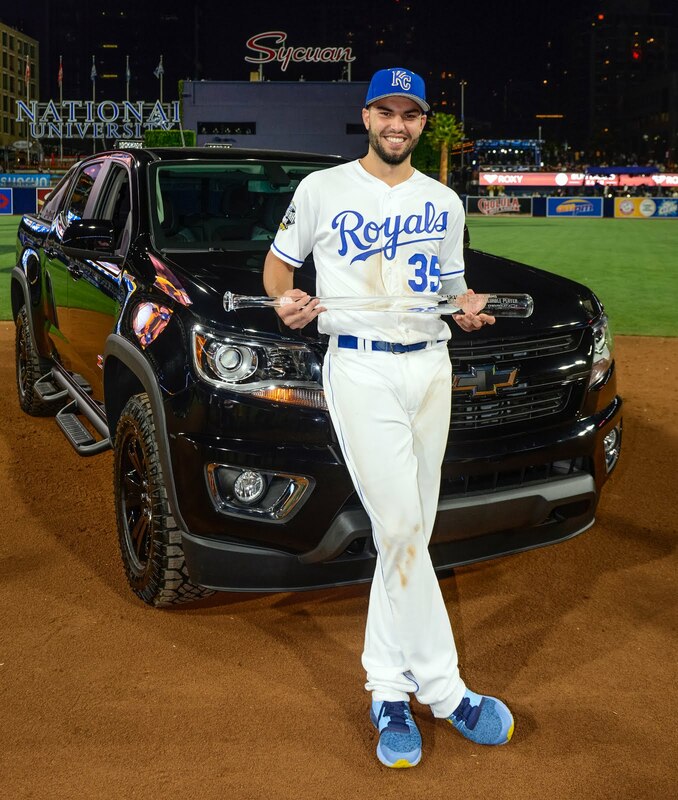 Chevrolet, America’s most awarded car company, gave Hosmer who went 2-for-3 in the contest with a home run, two runs batted in and a run scored, his choice between the 50th Anniversary Edition Camaro SS Convertible and a Colorado Diesel Midnight Edition. This is Hosmer’s first All-Star MVP award and the first for a Kansas City Royal since Bo Jackson in 1989. “Hosmer’s spectacular on-field performance tonight demonstrates to all baseball fans and especially our kids that hard work, determination and teamwork is what wins, and that is why Chevrolet is proud to present the MVP award,” said Brian Sweeney, U.S. vice president of Chevrolet. Chevrolet Youth Baseball program has helped raise more than $28 million to aid hometown teams over the last 10 years. Nearly 5.2 million young people in communities across the country have benefitted from the program, and more than 1,500 Chevrolet dealers are involved. Additionally, through Chevrolet Youth Baseball, more than 90,000 equipment kits have been donated to teams around the country, nearly 11,000 parks have been renovated and more than 111,000 children received complimentary instruction on baseball fundamentals. During the afternoon’s Red Carpet Parade, Hosmer, along with his All-Star Game teammates from both the American and National Leagues, signed a 50th Anniversary Edition Camaro hood that will be auctioned in the coming days on MLB.com. The proceeds of that auction will support the MLB-MLBPA Youth Development Foundation. The Colorado Diesel Midnight Edition that Hosmer chose begins as a black Z71 Colorado Diesel and adds an all-black front end with body-colored grille, bumper, badging, black 17-inch wheels and aggressive Goodyear DuraTrac® tires that add a rugged, off-road appearance. Founded in 1911 in Detroit, Chevrolet is now one of the world's largest car brands, doing business in more than 115 countries and selling more than 4.0 million cars and trucks a year. Chevrolet provides customers with fuel-efficient vehicles that feature engaging performance, design that makes the heart beat, passive and active safety features and easy-to-use technology, all at a value. More information on Chevrolet models can be found at www.chevrolet.com. Mike Soich of Knapheide Manufacturing shows off a new Knapheide and SnugTop collaboration that brings Knapheide's KnapKap truck topper program from steel only to choices of steel, aluminum and fiberglass, and all can be ordered directly through Knapheide. In this case, Mike is showing off a Pest Control turn-key package that includes hose reel, tank, pump, lockable chemical storage, easy rear access with back up camera, HD 500 lb. capacity rack by Prime Design with hydraulic drop down assist. This one also sports the new Sortimo HD drawer unit with two drawers to show them off. Watch Christy Webber and Jason Sloat explain how tough trucks and expert customer service from General Motors Fleet help Christy Webber Landscapes maintain parks, stadiums and public buildings across Chicago. 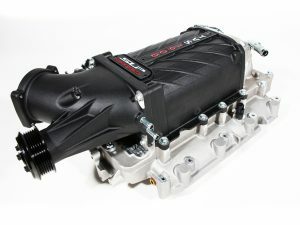 Street Legal Performance (SLP) announced that it now has supercharger systems available for 2014-2016 Chevrolet Silverado and 2014-2016 GMC Sierra with 5.3 and 6.2-liter engines. The SLP Supercharger System for 2014-16 GM trucks powered by a 6.2-liter V8 boosts performance of the direct injected high-compression platform to 590 horsepower. “That’s an additional 170 horsepower at 5,700 rpm and 130 lb-ft of torque at 4,100 rpm, resulting in a tire-shredding 41 percent horsepower and 28 percent torque increase over stock,” SLP reports. For 2014-16 GM trucks equipped with 5.3-liter V8, the SLP supercharger provides an additional 165 rear-wheel horsepower at 6,000 rpm and 167 lb-ft of torque at 3,200 rpm, with an end result of 520 horsepower and 550 lb-ft or torque. That equates to a 46 percent gain in horsepower and a 44 percent boost in torque over stock. SLP’s supercharger systems for 2014-16 Chevrolet and GMC trucks are developed in-house by talented SLP engineers utilizing OEM CAD data to optimize available space for the best possible fitment and maximum performance. Chevy Supercharger under hoodThe SLP 1900 supercharger system is part of the TVS (Twin Vortices Series) line of superchargers, utilizing Eaton’s TVS technology rotating assembly to deliver more power and better fuel economy in a smaller package. This is the same technology that has been used and proven for years in OEM high-performance applications such as the Cadillac CTS-V and Chevrolet Camaro ZL1. The positive displacement supercharger features twin four-lobe rotors twisted 160-degrees. By comparison, the original Eaton supercharger rotating assembly featured three lobes twisted 60-degrees. “The added benefits of this design include vastly cooler discharge temps than competitive twin screw designs, higher volumetric capacity, higher operating speeds, a smoother, more efficient flow of air into the engine, and improved noise and vibration characteristics,” SLP states. Watch Bert Perozzi, Dale Meier, and Chris Rolsen point out the industry-leading standard features found on Knapheide Standard Service Bodies. DETROIT – Five Chevrolet vehicles led their segments in the J.D. Power 2016 Initial Quality Study. No other brand has more J.D. Power Initial Quality awards than Chevrolet — for the fourth consecutive year. This follows the brand’s strong showing in the 2016 J.D. Power Vehicle Dependability Study, where Chevrolet also had more models ranked highest in its segments than any other brand. Chevrolet’s focus on the customer has fueled a 3 percent gain in retail sales for the first five months of 2016. In the same period, Chevrolet’s share of the retail sales grew 0.6 percentage points, making Chevrolet the fastest growing full-line brand in the industry. • Silverado swept the full-size truck categories, with the Silverado 1500 receiving the top marks for light-duty trucks and the Silverado HD receiving the top marks for heavy-duty trucks. • Equinox led the compact SUV segment (in a tie), with study results that were 15 points better than the segment average. • Tahoe lead the large SUV segment, with study results that were 19 points above the segment average. • Finally, the Spark dominated the city car segment, with study results that were 48 points higher than the segment average. The study, now in its 30th year, examines problems experienced by vehicle owners during the first 90 days of ownership. Initial quality is determined by the number of problems experienced per 100 vehicles (PP100), with a lower score reflecting higher quality. The 2016 U.S. Initial Quality Study is based on responses from more than 80,000 purchasers and lessees of new 2016 model-year vehicles surveyed after 90 days of ownership. The study is based on a 233-question battery organized into eight problem categories designed to provide manufacturers with information to facilitate the identification of problems and drive product improvement. The study was fielded from February through May 2016. AUV Offers Unique Benefits For Contractors and Artisans! AUV - Access Utility Vehicle by Monroe offers loads of benefits for contractors and other artisans! This body is a good choice for doing work on site. Whether you're a farrier tending to horses on the ranch, or a locksmith working on location, or any number of specialized contractors and jobbers who need tools, machines, and skills on site, on location, this unique design of truck body may do the trick. High Grade Aluminum Construction, aluminum is corrosion resistant, saves weight of the body and saves fuel. Overhead door design allows for increased length of reach into the storage area and shelters technicians from rain. Shelves are fully adjustable and bins can be added to suit the storage requirements. Large, clear side areas available for signage and logos. Various vocational packages available with many customizable options. Download a pdf brochure here. Check out this awesome City Express Van with interior folding shelves. This is a great solution to so many different industries. Incredible gas mileage, maneuverable in the city, and always easy to park. Check out this video to find out more. This great truck is the perfect solution for many contractors. It is a 12' Harbor Combo Body mounted on a 3500HD Regular Cab Chassis with the DuraMax diesel. 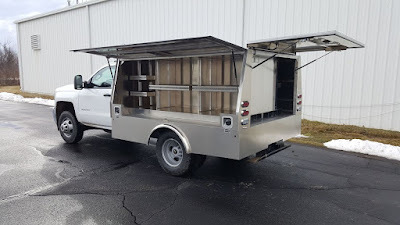 The Combo Body as it is commonly called today, is essentially a Service Body where the rear compartment has been removed and a 36" floor level work platform that extends to the outside edge of the body is installed. Then, short contractor style fold-down gates are added, and these typically are seen with material racks as well. The work platform is at a perfect height for a lot of on the job work projects, and the area is large enough to handle bulky items like a sheet of drywall or plywood. Any contractor who often does work in the field at the job site and needs plenty of space for tools and equipment will find the Combo Body to be a great solution. This walkaround on the Supreme Spartan Plumber style body shows just how useful this setup can be, not only for plumbers who use them quite often, but to any contractor where tools and parts are needed together with a space to do some work inside. Think of it as a service body with a tall roof on it, with shelves inside. Plus, it is all mounted on a Chevy 3500 Cutaway Van Chassis, which comes standard with a short turning radius for excellent maneuverability, and it is lower to the ground making entry and exit so much easier. This one has the 4.8 liter V-8 engine to give great power and good fuel economy. See more of our commercial work trucks at http://www.paradiseworktrucks.com. The Cutaway Van Chassis is such a great chassis for many different types of truck bodies, and hands down, the most popular body on the cutaway chassis is the Plumber Style Body. Because the chassis is naturally lower to the ground than conventional chassis, this helps the Plumber Body to be so easy to work out of, carrying all manner of parts and materials inside, while a vast number of tools and other things in the outside door compartments. In this case, the body is 13' long (12.75') and has five compartments on each side. But, it isn't just a Plumber Body. It's also an HVAC Body, Remodler Body, Electrician's Body, Mechanic's Body. In fact, there are so many different types of contractors and jobbers who could make excellent use of this great truck body, and advertise their business on the side billboard at the same time! Let Mike Olin of the Paradise Chevrolet Fleet Department team give you a tour of this 2016 Chevrolet 4500 Heavy Duty Chassis and the Knapheide KUV Plumber Style Body. This is an example of a Service Body with a raised cargo bed enclosure fitted with barn-style rear doors, and a 3-piece cargo bed enclosure that opens up two thirds of the bed area when needed. This is a great way to keep things carried in the back area out of sight and out of mind. This Harbor 8' single rear wheel Service Body also sports some great built-in drawers in the streetside front compartment, HD material rack with Rack-Straps on both sides, class IV receiver, and more. Take the tour courtesy of Mike Olin of the Paradise Fleet team by watching the video.